Right on the heels of a post about David Hartman and halakhic community, this post about aesthetic community and Jacques Rancière makes a lot of sense. I just finished The Emancipated Spectator, and have to say that I haven’t liked a critical theorist this much in a long time. 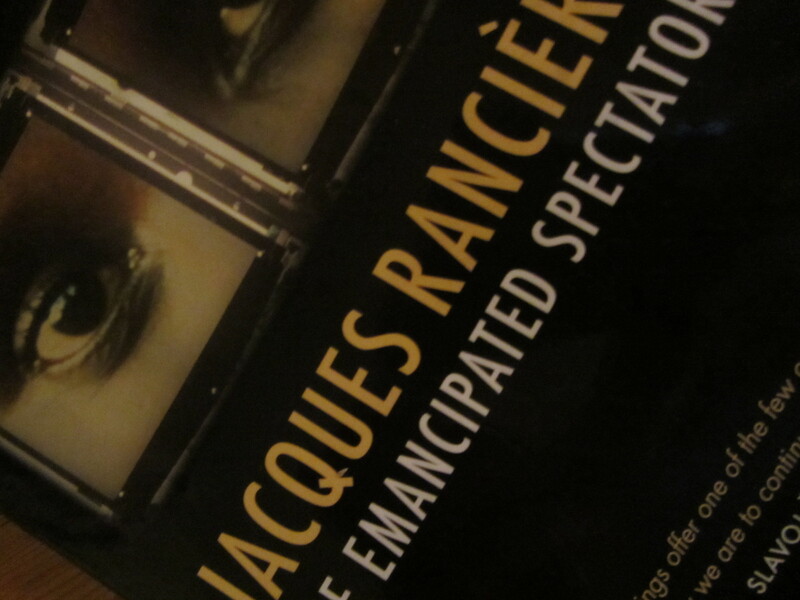 My friend and colleague GH explains that it’s because Rancière is not a crypto Platonist. This comes out especially in what I at least perceive to be his iconophilia. Against the iconophobic tradition in French critical theory identified by Martin Jay, Rancière seems more able to mediate the society of spectacle, whose allegedly negative effects on the real have been pilloried by Marxist critics from early Barthes and Guy Debord to Zizek (and Badiou?). For the studies of religion, including Judaism, I can’t help but think how incredibly important Rancière is. emancipated spectatorship” signal a basic trust in the human capacity to figure things out, no matter how smart you are, the “same intelligence at work –an intelligence that translated signs into other signs and proceeds by comparisons and illustrations in order to communicate its intellectual adventures and understand what another intelligence is endeavoring to communicate to it” (p.10). Blurring the difference between those who act and those who look or gaze, Rancière asserts the ontological and political dignity of theater, illusion, art, mediation, images, and the distance that is the sine qua non of communication (pp.10, 19). Central to the image is not a mimetic relation between the image and its referent, which it either gets right or wrong. The image is most of all constituted by its relation to other images, a multiplicity of images, poetic and visual alike, a set of relation between the said and the unsaid, the visible and invisible (p.93), and the way in which they combine to create an “equivalence” (i.e. not a copy of something real) to form a “common sense” or “aesthetic community.” These are defined as “a spatiotemporal system in which words and visible forms are assembled into shared data, shared ways of perceiving, being, affects, and imparted meaning. The point is not to counter-pose reality to its appearances. It is to construct different realities, different forms of common sense –that is to say, “different spatiotemporal systems, different communities of words and things, forms and meanings” (p.102). In relation to religion and to Judaism, it is easy enough to transpose into them everything said by Rancière about aesthetic community and about these combinations of brilliant appearances and sordid truths as the essence of the aesthetic and ethics of religion in its constitution as a system of representation. At least twice, Rancière himself notes that the critique of the image and of spectacle can be traced back to Feuerbach and Marx’s critique of religion, and we might add, of metaphysics. Rancière very much promotes the value of separation in relation to non-separation (pp.6-8, 15). What opens this kind of political theory to religion post-critically is its investment in the sensible, in images and the imagination, the way it suggests how one might suspend “reality” without ever losing touch with it. This entry was posted in uncategorized and tagged aesthetics, politics, Rancière, what i'm reading. Bookmark the permalink. In epistemology, coherence theories get into trouble when they seem to deny that the world is one way or the other or that some theories get closer than others in correctly describing reality. Justifying a religion as a language and images parallel to reality floating in its own space is a difficult sell. Why else would Hartman go on about the Sinai covenant if he didn’t feel the need to ground the world constituted by past, present and future Torah discourses in some non verbal reality? The ‘must’ aspect of halacha seems connected not just to other similar discourses but to reality itself. So I think it would be helpful if you could elaborate on what it is to “suspend “reality” without ever losing touch with it.” Is contemporary immersion in Torah and Jewish ritual something like going to the movies? Or is it a “Matrix” like experience? Matrix would be too ungrounded for what I or Ranciere have in mind, or for that matter Jean Baudrillard, who completely renounced his paternity to the Matrix conceit. The relation between image and reality as I see it tends to be more existent than non-existent, but more indirect than direct. Thanks, as always, for the keen critical pushback. As a recent admirer of Rancière’s work, but an outsider to Judaism (though I have a deep interest in it), I would love to hear more about the relations of Rancière’s writings and Judaism. Hi Gabriel: The bad news and the good news news is that there is no relation between Ranciere and Judaism-Jewish philosophy. The bad news is that Jewish philosophers neglect his work if they have even heard of him, which I assume they have not. He’s not, alas, on the radar. And Ranciere has himself said nothing explicitly about Judaism or religion, which is sad because he’s smart. The good news is that it’s an open field. You can say pretty much what you want and there’s a good chance it will stick. And, as I’ve opined, I think he says very important things that are close to religion in the relation of religion (and Judaism) to certain kinds of image work and certain kinds of spectacle. I mention him in some of my musings on Buber and politics. His writing on “spheres” (aesthetics, politics) is helpful for anyone thinking about the subject, and so it’s relevant to Buber’s “classification” even if not directly to Judaism (except insofar as Buber maintains throughout his life that Judaism denies the possibility of “spheres,” as anything more than heuristics of which we should be suspicious).